The National has been on a roll lately- playing great shows, getting critical praise, and somehow finding ways to generate positive buzz around each of their releases. As a band, they have set high expectations amongst an intellectual crowd and they consistently deliver, proving that they are deserving of all the indie praise they’ve been getting for the last two albums. Their new work, Trouble Will Find Me, is no exception, and it seems a crime that I have not yet given them coverage on this blog. 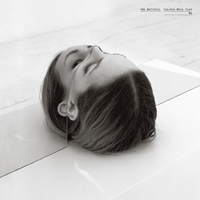 If you think The National are too pretentious then this is the perfect album for you to hate. It never tries very hard to do things the standard way. Trouble Will Find Me makes heavy use of odd time signatures. This keeps new listeners bobbing their heads but unsure of what to expect. And that works for these songs because this isn’t supposed to be pop music. It makes the listener focus more on the moment to moment, and it serves to create a more emotional experience. This is a more advanced and refined High Violet, and I love it. The National have always had an interesting lyrical style, like poetry put to music. The less I look the more I see the pythons and the limbs"
Lead singer Matt Berninger has always had a lot to say and the format of this album allows him to vent, getting away with practically just talking at times. The song beats end up more sprawling and less compartmentalized, less structured. The result may initially seem directionless but are actually heartfelt diatribes. The confessions come off as more honest and it feels like the band has really opened up to their fans. The National concerts have always felt like very personal experiences but Trouble Will Find Me pulls that off through the speakers. In short, this album is nothing short of amazing. It is filled with heartbreak, soul, self consciousness, and redemption. The quality bar is consistently very high for every single track throughout- they are all a pleasure to listen to whether in the background of a party or with your full attention alone in your room. In a year filled with some aggravatingly average albums, this one’s competing for best of the year. Don’t miss it.